We had a brief stint of summer here, with one day reaching 92, but so far haven’t quite made it to the sustained heat I know is imminent. I am constantly torn between being grateful the heat is holding off, and lamenting the lack of heat training I can do for my upcoming summer races. In any case, as the plants in my garden sprout and grow, it makes me excited for harvest and all the lovely dishes that come with a summer bounty. 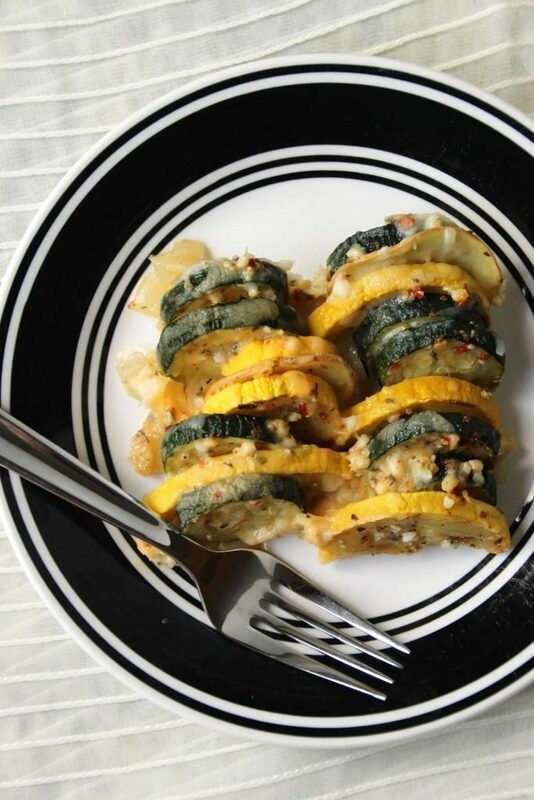 Summer squashes like zucchini and yellow squashes are some of my favorite veggies, and their relative cheapness here means I eat a ton of them throughout the summer and early fall. I add them to salads and scrambled eggs, eat them plain with hummus or pesto, and freeze them for when the weather turns me towards soups. Their neutral flavor makes them an easy addition into almost anything, as well as being a delightful standalone. 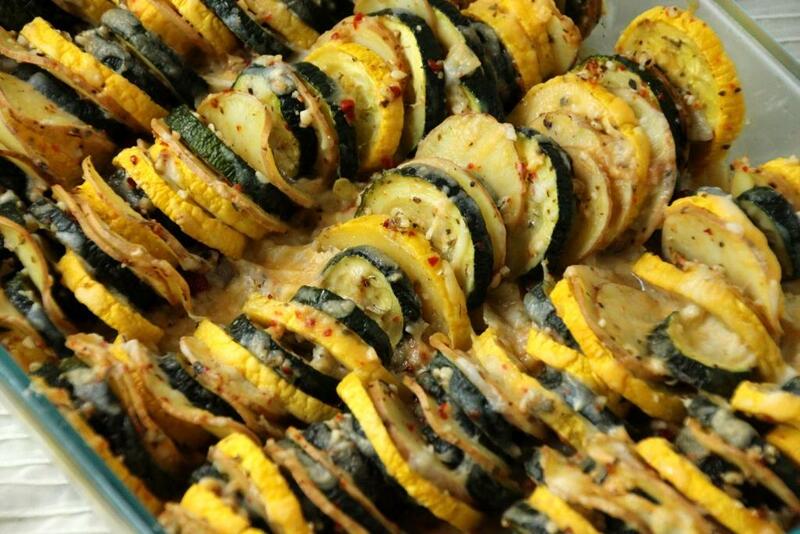 One of my favorite hot weather recipes is a simple baked dish. 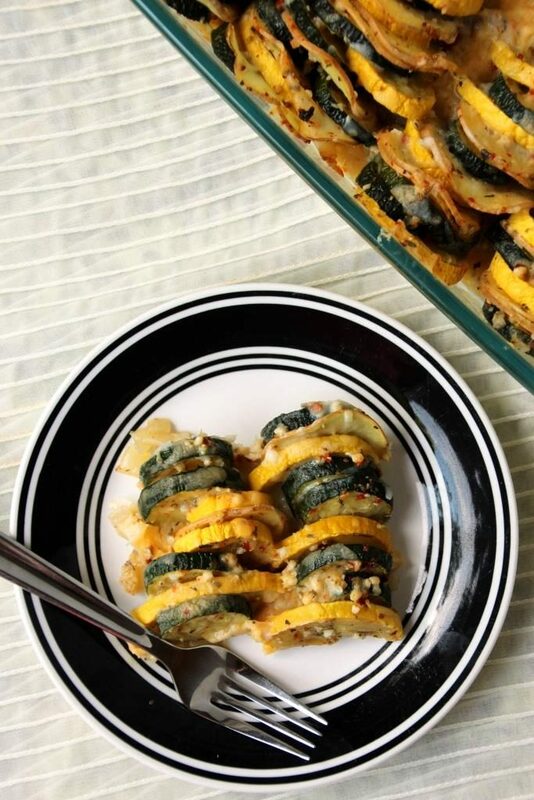 Summer squash and sweet potato are accented with onion and spices, then topped with a sprinkle of cheese for an easy but delicious side great for the hot months. You may be wondering how baked vegetables could possibly be warm weather appropriate, but the secret is I actually prefer this one cold! Not only does that make it easy to serve straight out of the fridge for barbecues and leftovers, but it makes for a great make-ahead meal as well. Simple without being boring, this vegetarian concoction works great as a side dish when you get bored with salad, or as a healthy afternoon snack. For the vegan crowd, you can just leave off the cheese – it’s quite excellent without it – but you may want to add a pinch of salt to your spice mix. Briefly sautéed onions and roasted squashes bring a light sweetness to the dish, complimented with your favorite spices. This one is easy to customize to whatever you’re pairing it with: just change up the spices to match or contrast with your entrée. I used an Italian spice blend, but you can easily concoct your own mix or just include one spice for a simpler flavor profile. Pairs beautifully with a side of grilled anything, and makes for an easy lunch since it requires no reheating. I’ll admit it’s a little messy and time-consuming to slice and vertically arrange so many items, but it’s worth it for even cooking and presentation points. I like to use a sweet potato, but if you prefer a white or red that is excellent too. The dish is easiest if you can find squashes and potatoes of roughly all the same diameter, but as you can see I have a variety of sizes in mine and it’s completely manageable. When the over abundance of squash hits your area, give this a try and let me know what you think! In a small or medium frying pan, heat 1 Tbsp olive oil over medium-high. Add onions and garlic and sauté until onions are soft and translucent, about 5 minutes. Spread evenly into the bottom of a 9×13″ baking dish. Using the same method, slice sweet potato into less than 1/8″ slices (I used the thinnest setting on my mandolin.) This ensures the potatoes cook in the same amount of time as the squashes. In a large bowl, combine squashes, sweet potato, 3 Tbsp olive oil, and spices. Stir until well coated. Arrange upright in rows, avoiding having large sections of the same vegetable if possible. This is messy, but worth it for even cooking and prettiness. Cover dish with foil and bake for 30 minutes. Remove foil, top with cheese, and bake an additional 10-15 minutes until cheese is to your desired level of meltiness. 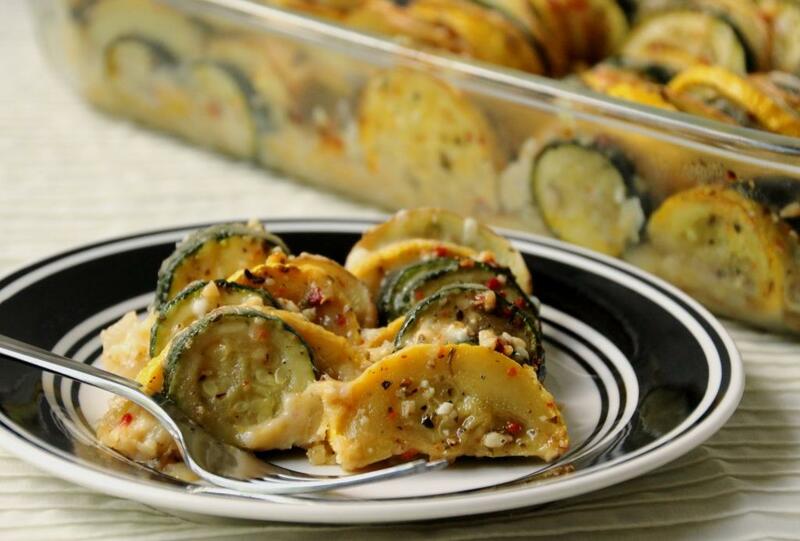 1 This does not reheat well but I actually prefer it cold which makes it not only a great make-ahead meal, but also a great side dish for hot summer days.